The NILFISK-ADVANCE HYDRODRY is an electric floor dryer. 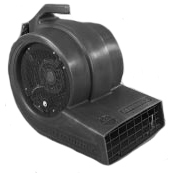 The molded housing allows the unit to sit flat, 45 or 90 degree angles for the appropriate drying. The polyethylene housing is durable and strong to withstand many years. The NILFISK-ADVANCE HYDRODRY features a molded-in carrying handle for easy transportation.